Today's science press release out of the Division of Planetary Sciences meeting concerns changes in lakes near Titan's south pole observed during Cassini's mission. 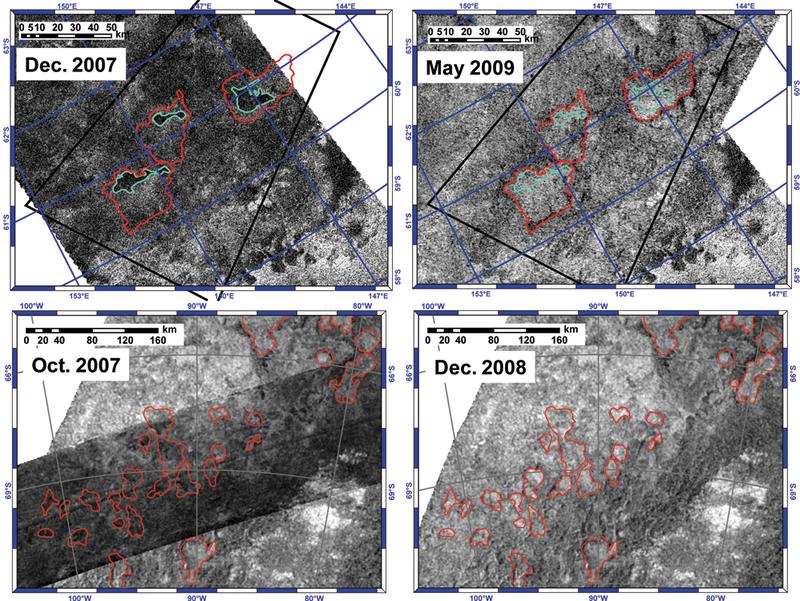 In brief, repeat Cassini RADAR observations of the same spots during different Titan flybys turned up places where there appeared to be dark lakes in earlier images and dry lakes in later images. This is one of those results where it would have been more surprising if Cassini had found no evidence for change. We know Titan's surface is geologically very young, and we know it has an active cycle of methane clouds, precipitation, and evaporation, so it would have been quite strange if Cassini had seen no changes. But it's unusual enough to observe changes on any solid-surfaced world in the solar system over the short time scale of the life of a single space mission that it's really, really cool to a planetary scientist to be able to line up before-and-after views of a spot on a world and say, "hey, that changed!" Here's two sets of maps of areas of Titan's high southern latitudes. The left-hand images are "before" and the right-hand images are "after." Red outlines denote lake shorelines, wet or dry -- Titan's south contains many more features that look like dry lakes than it does features that look like wet lakes. In the top pair of maps, it is really easy to see the changes -- the areas outlined in blue are quite dark in the left-hand (December 2007) image, and are indistinguishable from their surroundings in the right-hand (May 2009) image. Cassini's RADAR instrument has performed repeat observations of several areas near Titan's south pole and found evidence that the extent of lakes has changed with the changing season. Throughout Cassini's time at Saturn to date it has been late summer in Titan's southern hemisphere. Areas outlined in red are in the same locations before (left) and after (right). The changes in the bottom image are a little more difficult to see, so I thought I'd dive in to the original data and make a blink gif that compares the two. The December 2008 data was just delivered to the Planetary Data System last week, so this is hot off the presses! I'm very, very grateful to Jason Perry for his public service of converting the PDS-formatted Cassini RADAR data to JPEGs that are much less painful to deal with. Jason has posted all the publicly available RADAR data to his Titan RADAR website. A comparison of the same area as seen on two different Cassini RADAR flybys shows that some lakes near Titan's south pole dried up during the intervening 14 months. These types of observations are only possible when Cassini's RADAR is used to point at the same spot on Titan twice, of course. It'd be nice if Cassini could look at all of Titan repeatedly to see how it changes with the seasons, but the mission just can't accomplish that. The RADAR instrument only acquires long, skinny image strips when it's relatively close to Titan, and won't even cover half the area of the moon throughout the planned mission. Any plans to acquire repeat coverage of the same areas have to be balanced against the need to use the same flyby to image areas that otherwise wouldn't get seen at all. If we really want to study how Titan changes with the seasons, we need an orbiter that can get repeat coverage of large areas of the moon -- and that can do so over a long enough period of time that it can actually expect some seasonal changes. I think the best news from this press release is that they have observed changes over what are really pretty short time scales for Titan, about an Earth year. Titan's years are nearly 30 Earth years long, and its days are nearly 16 Earth days long, so changes over an Earth year on Titan are equivalent, seasonally speaking, to changes on Earth that span a few weeks.